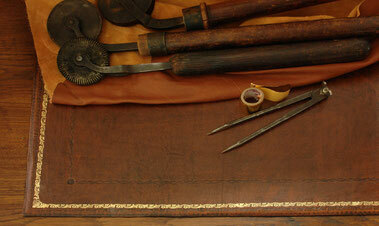 As an antiques dealer and artisan, I'm producing leather writing mats in limited editions. These pads are loose and usable for every writing table. They are reinforced with bookbinding cardboard and have a felt backing. Each mat is produced with old bookbinding technique, which is very seldom used today. The leather surface of the pads are mostly patinated in the old english style, which gives them the typical antique look. The rim has got an ornamental embossing, normally one gold line and two or three blind lines. Every writing pad is handmade and an unique piece in his character. To be sure I'm there, please phone 089/6929592 or 0172/4120464.